Queen’s Own Gurkha Logistic Regiment Regimental Sergeant Major Handover/Takeover. 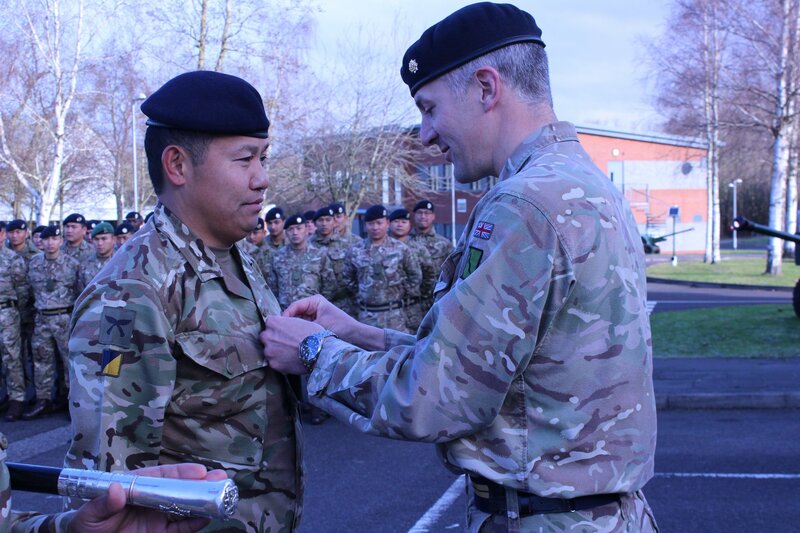 On Monday, the 5th of February 2018 Warrant Officer Class One Dipendra Rai handed over the appointment of Regimental Sergeant Major (RSM) The Queen’s Own Gurkha Logistic Regiment (QOGLR) to Warrant Officer Class One Prakash Gurung on parade in front of the assembled ranks of the Regiment at Gale Barracks, Aldershot. 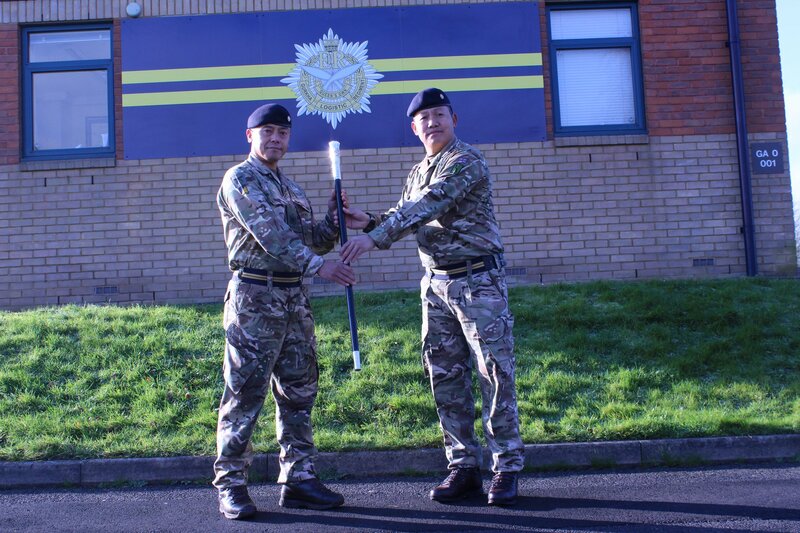 This was a truly historic day – the first time that a GURTAM RSM has handed over to a fellow Gurkha since 1994 in Hong Kong, and the first time this has ever taken place in Aldershot. Within the Royal Logistic Corps, the appointment is unique, managing Regimental personnel of whom approximately 70% are Nepalese and 30% are British/Foreign and Commonwealth soldiers. 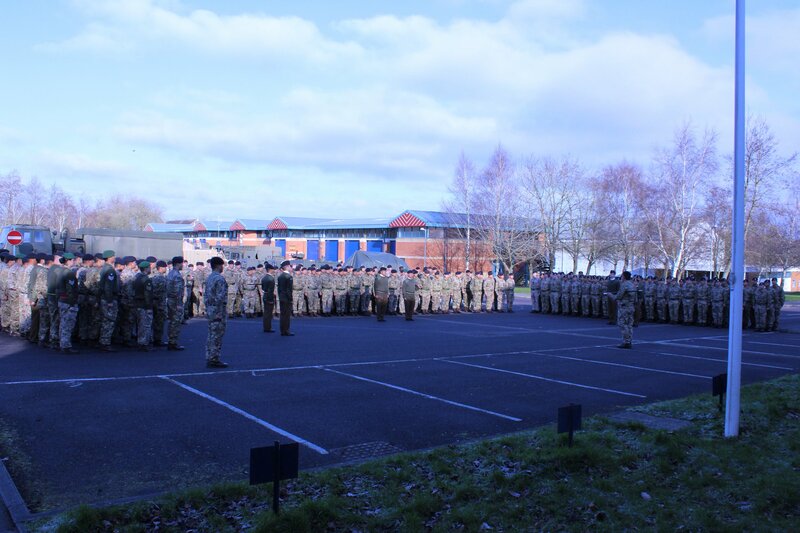 The RSM also has responsibility for those soldiers employed within the wider QOGLR at Extra Regimental Employment. Once the handover of the RSM appointment was completed, the Commander had the honour of Commissioning Warrant Officer Class One Dipendra Rai as Captain Dipendra Rai in front the entire Regiment. Captain Dipendra leaves the UK imminently to assume the appointment of QOGLR Detachment Commander in Brunei. Commander QOGLR congratulates and Welcomes him to the Officers’ Mess. His tenure as the inaugural Gurkha RSM of the 21st Century has been a brief yet glorious undertaking, with many highlights, culminating the hugely successful visit of the Army Sergeant Major and Royal Logistic Corps Sergeant Major only days ago. He has been unique. On behalf of the Regiment he is thanked for all his endeavours within the QOGLR.